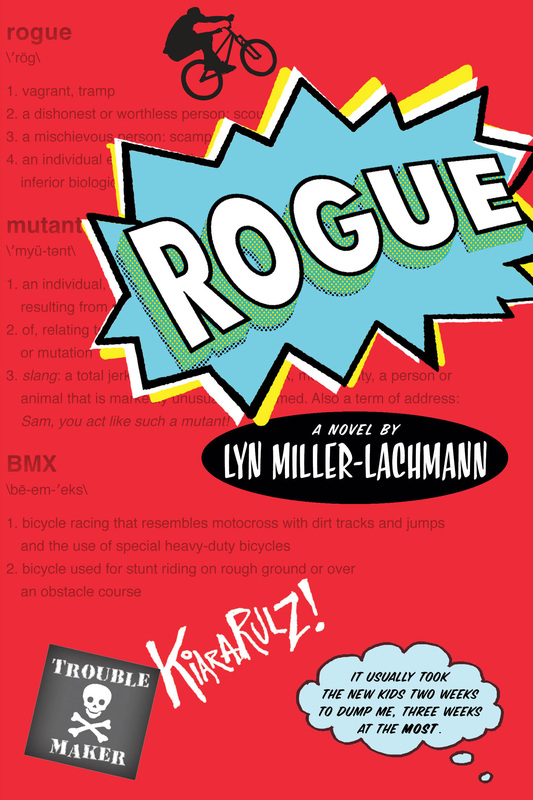 Middle grade fiction is hot right now and a bold new novel came out this spring—ROGUE by Lyn Miller-Lachmann. Lyn and I go way back so I asked her to stop by and share some author insights about her latest book for young readers. I originally wrote the novel as a YA, but my editor, Nancy Paulsen, suggested I revise it for an older middle grade readership. The revisions were substantial, going much further than cleaning up the language and sexual references. I had to learn what is considered “age-appropriate” for middle school readers—an even more difficult challenge because, as someone on the autism spectrum myself, I have trouble understanding social rules and conventions. In fact, my YA novel Gringolandia broke a lot of the rules of the genre in its honest depiction of the effects of dictatorship and torture, and I received a lot of critical praise for my willingness to trust teens’ ability to appreciate hard truths. In fact, the middle grade genre is full of outstanding books that take on tough subjects. My editor is also the editor of Jacqueline Woodson’s award winning After Tupac and D Foster, which takes on some of the same issues along with foster care and homosexuality, and more recently, Lynda Mullaly Hunt’s powerful debut novel One for the Murphys, the story of a foster child that also deals with child abuse, alcoholism, and bullying. Alcoholic parents regularly appear in fiction for this age group. In Rogue, Chad, the boy that Kiara wants to be her friend, is heading toward alcoholism, which might make the story a bit edgier because it’s a peer and not an adult. On the other hand, Kiara does not drink, and Chad is widely seen as a “bad” boy. It takes someone like Kiara—herself an outcast from society—to see the good in Chad and to work toward finding a place in the world for him as she also struggles to find such a place for herself. 2. Speaking of age-appropriateness, I was struck by the fact that Kiara is thirteen or fourteen, but she tends to act much younger. How does that affect the age level of the novel’s potential readership? The rule of thumb is determining the age of potential readers is “one year younger than the protagonist.” However, autism is a developmental disability that affects the person’s social interactions and ability to communicate with others. So Kiara may be a young teenager, but she often acts like a child. Children and adolescents on the autism spectrum often feel more comfortable interacting with adults, as Kiara does with her neighbor, Mrs. Mac, or with much younger children. Even though Kiara at first only plays with six-year-old Brandon because she wants his twelve-year-old brother to be her friend, her relationship with Brandon turns out to be closer and less rocky than with Chad, who’s almost a peer. Because Kiara doesn’t fit easily into age categories, the novel may well appeal to a wider age range, particularly for young people with special needs. When ROGUE was a work-in-progress, I read the first chapter and spoke about the novel at an alternative high school for boys who had been expelled or excluded from their neighborhood schools. Even though the boys ranged in age from fourteen to seventeen, they could all relate to Kiara and what she does. 3. I thought a lot about gender as I read ROGUE. Desperate for friends, Kiara finds a way to belong by filming boys who do BMX and skateboarding stunts. At times I worried that she was taking on a passive role yet at the same time I was happy to see a girl occupying space normally reserved for boys. Why did you decide to immerse your female protagonist in a very male world? While boys often teased me and sometimes beat me up, I also fought back and in doing so, gained a bit of respect. The girls in my school were flat-out cruel. In addition to the incident that begins Rogue, when the popular girl pushes Kiara’s lunch tray to the floor because she tries to sit at their table, I experienced many other instances of exclusion and bullying. One of the girls’ favorite things to do was invite me to a party that either didn’t exist or was a set-up for them to tease and humiliate me while I was stuck at their house without a ride home. I was so desperate for friends and so clueless socially that I fell for the trick long after anyone else would have figured it out. Oh, and I have a hair story too, but that’s an essay unto itself. I know that you’re very much a feminist, Zetta, and I regret to admit that I’ve always distanced myself from this type of activism because of the cruelty that I experienced from the other girls when I was younger. And when I look at my writing over the years, most of the stories are either written from a boy’s point of view, like Gringolandia, or feature a girl who by choice or necessity ends up in a very male environment. That said I don’t want to romanticize boys, because there are many children and teens afraid to go to school because they have become the target of violent male bullies and live in fear of assault every single day. In fact, the YA novel I wrote after finishing Rogue portrays a fifteen-year-old boy whose dreams of academic stardom end at the hands of a trio of bullies. Stay tuned! Lyn will be back later this week with an important guest post on bullying. You can learn more about Lyn at her website. Thank you for the interview, Zetta! I’ll keep checking in to respond to comments and questions.